Make this great piece quilt more simply than you expect. Use a Jelly Roll or two charm packs! 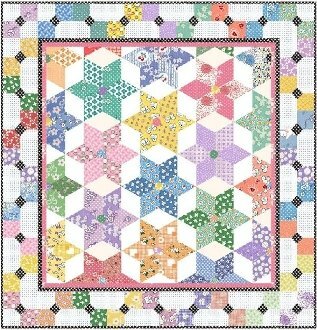 Add background fabric and you have everything you need to make this quilt. There are NO set in seams or Y seams as the top is pieced in rows. The technique is illustrated in color diagrams and photos in the pattern. Even the border bow tie blocks are way easy. The black squares are fused onto the centers and stitched down! * Super easy to cut and piece!